Since 2010 we have worked extensively with BC Racing on many unique projects for road cars and street cars alike. 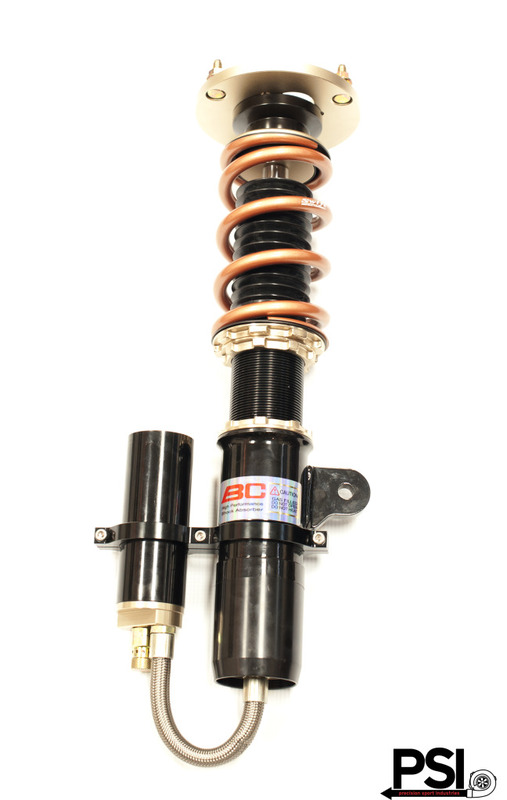 BC Racing has a unique approach to BMW suspension solutions. Their newest and most advanced model yet is the ER series coilover. It features large external reservoirs front and rear, separate rebound and compression adjustment and a twin piston design. The external reservoirs hold much more oil than the conventional coilover, allowing the coilover to operate for a much longer period of time before overheating. The external reservoirs also house the secondary piston, which allows for the adjustment of compression. This is the perfect coilover system for the person who wants to fine tune there setup using the separate, 30-way, rebound and compression tuning dials. Their BR model is perfect for street driving and occasional road course duty. With easily accessible adjustment knobs for fine tuning your compression/rebound and separately adjustable ride height, having a performance coilover system couldn’t be any easier. You choose how low or high you want your vehicle, no preset ride height here, and BC Racing’s patented concave lower locking ring keeps it locked in. All of their systems come with pillowball mounts to provide the most feedback possible from your suspension and to sharpen your steering response. BC’s available front and rear camber plates also allow you to get the perfect alignment setup without compromise. All this while providing a strong, attractive looking coilover system.